Niccole Modell enjoys a multi-faceted career as a freelance musician in the greater Ventura County area. She performs flute regularly with the Thousand Oaks Philharmonic, the Westlake Village Symphony, and the Channel Islands Chamber Orchestra. She also works as a pianist for several churches and serves as Music Director for protestant services at Naval Base Ventura County. Niccole is also the owner and operator of the Modell Music Studio in Camarillo, where she teaches private flute and piano lessons. 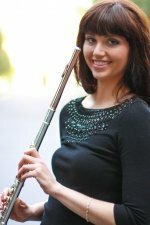 Niccole earned her Masters degree in flute performance from California State University Fresno as a student of Teresa Beaman. She also obtained Bachelor degrees in both flute and piano performance from La Sierra University, studying flute with Martin Glicklich and Peter Sheridan and piano with Elvin Rodriguez and Vadim Serebryany. After completing her undergraduate studies, Niccole pursued the Performer Certificate program at LSU. In addition to teaching and performing, Niccole collaborates regularly with composer Michael Glenn Williams on new music for flute. Her debut CD, Across the Sea, features the music of Stephen Zimmer. Niccole is a professional member of the National Flute Association and the Music Teacher’s Association of California.